In June, 17 students and adults joined our PWW-Honduras team for a week of service. The team of volunteers spent five days installing water filters and piping, building latrines, administering anti-parasite medication, and interacting with Honduran children and families. PWW: You just returned from a working volunteer trip with Pure Water for the World, installing water filters and latrines in Honduras. Please share a little about your experience. Carsten: Despite my prior knowledge of PWW’s aim, our trip to Honduras defied my expectations. I found that working on a different project each day added a new dimension to the experience as a whole. Not only did we have the opportunity to work with Honduran families and witness their living conditions first-hand, but we also spent time with community agents and PWW employees, who shared their hopes for the project’s development with us. Due to the multitude of responses towards our volunteer work, I felt inspired to support the program from the engineering stage all the way to the final installation. PWW: What is one of your favorite memories of the trip? Carsten: My favorite memory of the trip was traveling up the slippery, muddy paths in the back of the pick up truck. The views were amazing, and it was interesting to travel in the same mode of transportation as some of the locals. On our way through the coffee fields we saw trucks with loads of people commuting this same way from the city. PWW: What was your favorite part of the work you performed throughout the week? Carsten: My favorite workday would be the construction of the latrine. Although this day was backbreaking and sweaty, in retrospect, it was the first day we actually labored in the same intensity as many of the locals. This day was special because we worked alongside the locals, mixing concrete or digging trenches. The Honduran people were happy to lug concrete bags up a slippery hill, just to provide sanitation to the community’s children. They did it all for free, which was an inspiration. PWW: What was the most difficult part? Carsten: The most difficult- or rather the most uncomfortable- part of the trip was our first day of work in Trojes. We were installing water filters, it was pelting rain, and I was wearing tennis shoes with mesh fabric. After just our first filter installation, my socks were drenched and muddy and they squished with each step for the next few hours. It wasn’t until I purchased rain boots that I could work comfortably again. 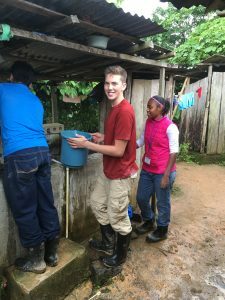 PWW: What did you learn during your time in Honduras that you didn’t expect? Carsten: I did not expect to see so much support and connectivity between the people of Trojes. They share a struggle and agree to accept the aid of PWW. I was surprised by the attendance of volunteers from the village and at some instances they outnumbered even our group. It was so rewarding to connect with these generous people and break down the stigma of violence and crime that is so often attributed to poverty-stricken areas of Central America. PWW: Would you recommend this trip to your friends and/or other teenagers? Carsten: I would definitely recommend this trip to my peers because of its potential for inspiration and motivation. As I was in a group of students, I made a lot of friends during my stay and my global perspective matured drastically. PWW: What would you say was most impactful part of your experience? Carsten: The most impactful part of my experience in Honduras was having the ability to work alongside people from around the globe who shared a common goal. Both the volunteers from PWW and the people of Trojes shared the passion of creating a clean water source. We managed to see the detriment of dirty water when we passed out deworming medicine to hundreds of villagers, and we worked alongside the Honduran people in their schools, homes and facilities. Although we were prompted to practice alertness in the volatile region of Central America, we realized very quickly that we did not have to fear the people we met on our trip. While crime still runs rampant in Central America, we were able to recognize the beauty of a third-world country without fear of theft, kidnapping or threats. In fact, at one point I had left my backpack with all of my belongings- including my passport and credit card- in a village home where we had recently installed a filter. At first I was afraid that I would never see my belongings again, but soon after I saw the eldest child of the home run up the mountain with my backpack to return it. Having the opportunity to experience the lives and personalities of the people we were helping allowed me to truly understand the essence of this project. PWW: You did some fundraising for PWW before the trip that continues today. Please share that information with readers. Carsten: My friend Talia and I set up a fundraising page through classy.org. We’ve raised over $3,000 so far and our proceeds go directly to the water-catching facilities at schools in Trojes. If you would like to support us, the link is http://www.classy.org/onewater. Thank you, Carsten and Talia, for your continued commitment to the families of Honduras. And an extended thank you to all of our amazing volunteers! PWW Travelers Honduras, PWW Travelers, PWW Trips, PWW Volunteers, volunteer for good. permalink.